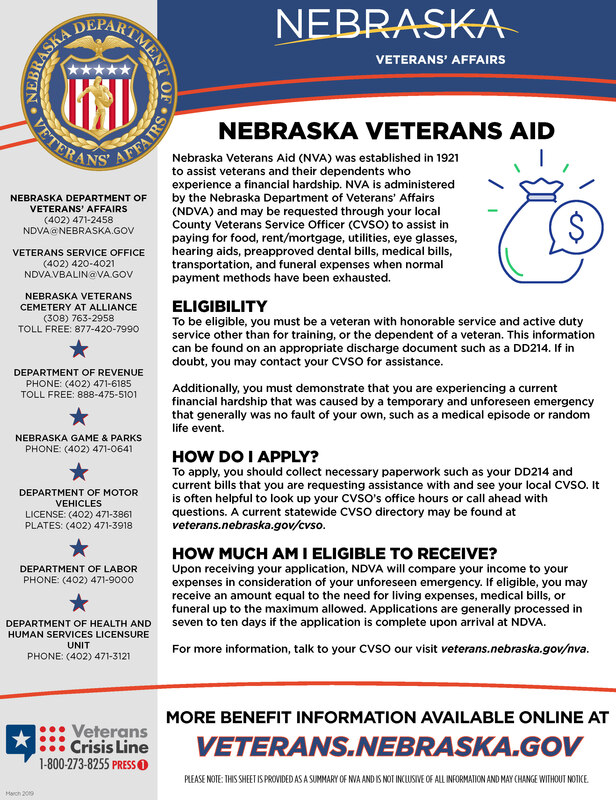 Nebraska Veterans Aid (NVA) was established in 1921 to assist veterans and their dependents who experience a financial hardship. For veterans and their dependents affected by the recent flooding in Nebraska, NVA may be able to assist with food, clothing, emergency housing (e.g. hotel accommodations), and eligible flood-related expenses. Applications will be considered on a case-by-case basis to determine the amount of assistance a veteran and/or their eligible dependents would be able to receive. The NVA application & US Citizenship Attestation Form (available through the CVSO). DD-214 showing the Character of Service. For food and/or clothing assistance is available for items lost or damaged due to flooding. The application has a section where the applicant asks for items and amounts they are requesting from NVA. The applicant is asked to provide a reasonable sum for food and clothing, and NVA will make the final decision on how much financial assistance will be provided for these items. Please Note: Payments to individuals are made by paper check, so there is a wait time. Veterans must apply for NVA through their County Veteran Service Officer.